If you're going to do something, you may as well do it right, right on the water that is. This Villa is no only beachfront, but due to its placement it looks like you are on the ocean. If you're going to do something, you may as well do it right, right on the water that is. This Villa is no only beachfront, but due to its placement it looks like you are on the ocean. 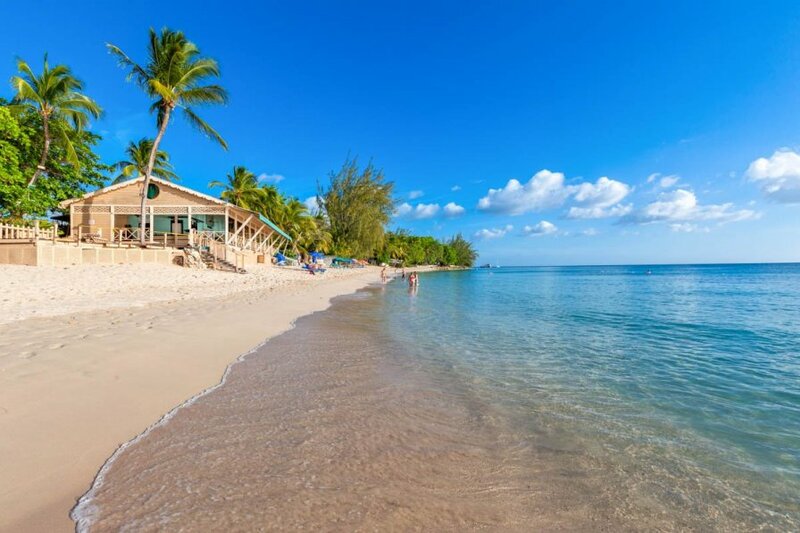 And while you're not quite floating, within a few steps from your front porch you can be on the sandy beaches of Mullins Beach and paddling in the crystal-clear oceans. This villa can accommodate six guests and it is the perfect getaway for people seeking solitude at a calm, modern home away from home. The decor is reflective of the beachside location, with soft blues and greens complementing fresh white walls and white-washed light wooden beams. As you wander through the home fresh air breezes in the large, open windows and it's hard to look out a window and not be greeted by the vast, lucious ocean. Each bedroom in this home has its own en-suite, because this is a luxurious home away from home where every need is met. The master bedroom is set upstairs, in a beautiful a-frame room and bathroom with an exceptional view that seems to go on forever. The kitchen is another spacious, modern room with everything you need to prepare a stunning meal complete with local delicacies. There are other useful amenities in the house, such as a security system and a safe to keep everything well protected. Needless to say, the home takes full advantage of its location and the many large windows and patios offer optimal enjoyment of the ocean views. Meals can be enjoyed on the dining patio, while the waves crash and the sun sets. Casa Turquoise can rented alongside its sister beach home, Villa Mahi Mahi. Please enquire for further details. Casa Turquoise is a 3-bedroom villa that is located on Mullins Beach, so be prepared to allow the gentle sound of the waves caress you and your guests to sleep. Barbados is one of the most stunning locations to visit, from the crystal clear waters to the candyfloss sunsets that bless the guests - what more could you want from a holiday? Days spend lounging on one of the many stunning beaches that Barbados is renowned for, and evenings spend listening to live reggae music while enjoying delicious local fish, it really is bliss. As if that wasn't enough, Barbados is an ideal place to visit anytime, with a warm and sunny climate all year round. It averages over 3,000 hours of sunshine each year, and it is treated to prevailing northeast trade winds that create a light breeze, so it's rarely unbearably hot. This villa is located at Mullins Beach, one of the most popular beach spots in Barbados due to its stunning scenery - really, if you are visiting Barbados this is the place to be. With a stunning beach, a bustling beach bar and plenty of amenities along the beach, you won't want for much - if anything. It's incredibly close to Speightstown, also known as Little Bristol, is the second largest town centre of Barbados. It is also just 12 miles north of the capital city of Bridgetown, which is a UNESCO World Heritage Site, meaning you are close to many, many entertaining day trips, restaurant and, of course, more beaches.